America Revealed: Are Police Becoming Militarized? Just how bad is the civil unrest associated with the Occupy protests in some U.S. cities? This bad: There is an online petition calling on California Gov. Jerry Brown to send the National Guard to protect Occupy Oakland protesters from the city's police department. In recent weeks, hundreds of protesters in Oakland have clashed with police officers in riot gear. In one tragic incident, a 24-year-old Iraq war veteran named Scott Olsen was critically injured when he was hit in the head by a teargas canister at close range. Even compared to the Occupy Wall Street demonstrations and other protests around the country, what's happening in Oakland shocks the senses. Judging from video and firsthand accounts, the police in that city have been especially brutal in dealing with the protesters. Just two decades ago, in the 1990s, the favored law-enforcement approach was community policing: the idea that police were most effective when they were intertwined with the community. This is a throwback to an earlier time, when a cop walked a beat, knew the neighborhoods and made sure doors were locked after dark. Now, in some cases, instead of the police serving the community, it's more like the police are at war with the community. How did we get here, in Oakland and elsewhere? And how do we go back? I have a friend who thinks he knows what went wrong. He's a cop who has been on the force more than 25 years, having worked himself into the upper management ranks of a midsized police department near San Diego. I'm comfortable in that world. My father is a retired cop who spent 37 years on the job. I grew up around cops. And now, some of my good friends are cops. I often say that while I cover politicians for a living, I'd rather spend the day with police. Yet my relationship with the institution of law enforcement is also complicated. My upbringing doesn't prevent me from -- in the course of doing my job -- criticizing police officers or law enforcement agencies when they turn into bullies, betray the public trust or deny a suspect due process. I'm also highly critical of the tendency of some police officers to dabble in areas of law enforcement they don't understand, such as federal immigration law. The siege in Oakland, where police have repeatedly clashed with protesters, reminds us that there's one other thing that police officers shouldn't do; impersonate soldiers. That's what concerns my friend, who agreed to talk with me on the condition of anonymity, given the sensitive nature of the subject. Like many law enforcement officers, he was in the military. But after he was discharged he began a career in civilian law enforcement. He knows the difference between the job that he used to have and the one he has now. But, he fears, that may not be true for a lot of cops on patrol these days. The way my friend sees it, our police forces have become militarized. "The mission hasn't changed," he said, "And that's to make people feel safe in their communities. It's how we go about doing it that has changed." These are miniature armies, stocked with every weapon imaginable -- all at the officer's disposal. "You make adjustments here and there," he said, "The next thing you know, there are machine guns in the squad cars." You heard right. Machine guns. And not in a weapons locker back at the station house. In many cities, the machine guns are in the police cars, next to the standard issue shotgun. On the officer's belt; a Taser, a 40 caliber handgun with 16 bullets in the clip and one in the chamber, a baton and mace. And that's for one officer. Multiply it out, and you'll get an idea of how much firepower is circulating out on the street. There is more on the way. Leaf through a police magazine these days and you'll see ads for automatic weapons, military equipment and the like -- all being pitched at police officers. 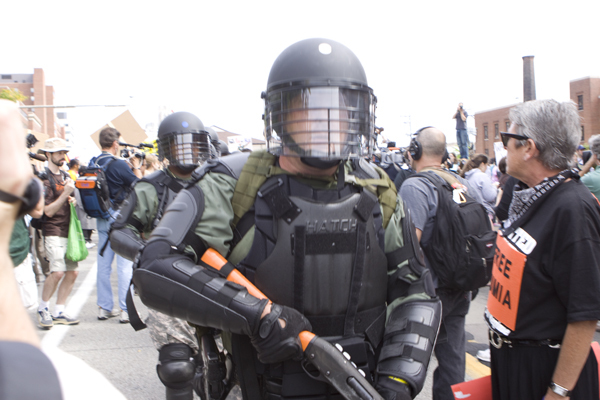 Midsized and larger police departments have long had SWAT teams. But now, even patrol officers have access to more firepower than they used to. The must-have item this holiday season: an armored assault vehicle. That's right. A tank, which will be back at the station house if you need it. "There's a sense among new recruits that police work is about soldiering," my friend lamented. "And we don't discourage it. In fact, we encourage it -- when (in reality) about 90% of what we do is community relations." He's right. Law enforcement isn't about kicking down doors. It's about building and maintaining relationships. Police officers have the power to either make their job simpler or more difficult. If they treat people well and build relations, people will cooperate. They'll have leads, witnesses and informants. But if they see the people they're supposed to "protect and serve" the way an occupying army sees the native population, they're going to encounter resistance, suspicion, defiance and other things that make their job harder. That's a recipe for chaos. Meanwhile, these mini-armies are always on the lookout for the next battle. And, as events in Oakland and around the country suggest, they usually find it. Police need to protect themselves as well as the citizenry, and ought to have whatever tools and weaponry is needed to do so. People who attack the police or who deliberately place themselves in unsafe situations have to expect consequences. I disagree...there is no need for the police to be driving tank vehicles, armed with automatic weapons and riot gear when going to a peaceful protest. These are scare tactics to discourage dissent and to quell protest. These tactics are very anti-American. The Constitution states that the people have a right to establish a militia to oust a corrupt form of government if it would arise. This militarization is meant to keep that from happening. It is a reflection of the fascism which has taken hold of our once, great nation; plain and simple.